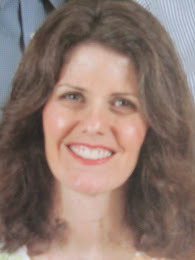 Where is your thotful spot, that place where you go to find your own thoughts? Winnie the Pooh's thotful spot was in the 100 Aker Wood. Mine is at the beach. When I've had a stressful few days, I book time with myself to spend an hour at the beach. 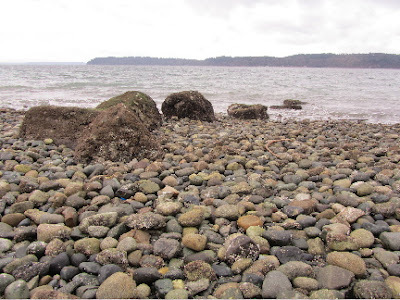 We have 4 Puget Sound beaches within 5 to 15 minutes, by car, from my home. 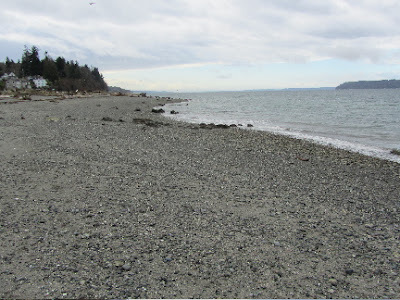 In summer, I walk down the hill to the long stretch of Sound beach closest to our home. 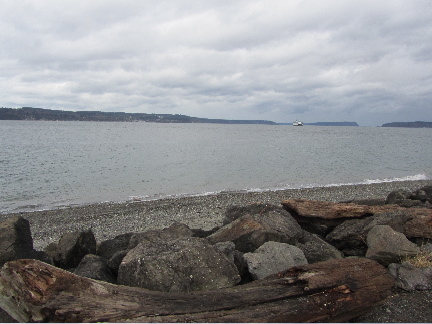 My kids like the activity of the busy downtown Edmonds beach, with ferries, scuba divers and harbor seals to watch. 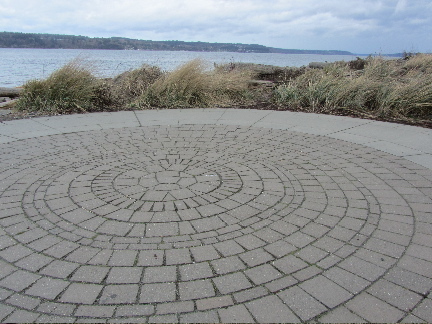 I prefer the mostly quiet, but beautifully designed Mukilteo beach, a 12-15 minute drive from my home. Yesterday morning, I needed some time with my thoughts. I brought my camera along, so that I could show you a bit of where I live. For a little geography, the Puget Sound is the large body of water that connects the Seattle area to the Pacific Ocean. Going west, there's us, the Puget Sound (filled with islands), the Olympic Peninsula, and then the Pacific Ocean. Yesterday, I went to my favorite beach, Mukilteo beach. There's quite a lot to see at this beach. There's the lighthouse. It's open for tours many month of the year. Lighthouse keeping is an interesting subject. I like to think of the families, who lived here, quite isolated from much of the population. They were a self-sufficient lot, going months between deliveries of goods, and a bit of the big city news. The ferry terminal is just to the north of the public beach. 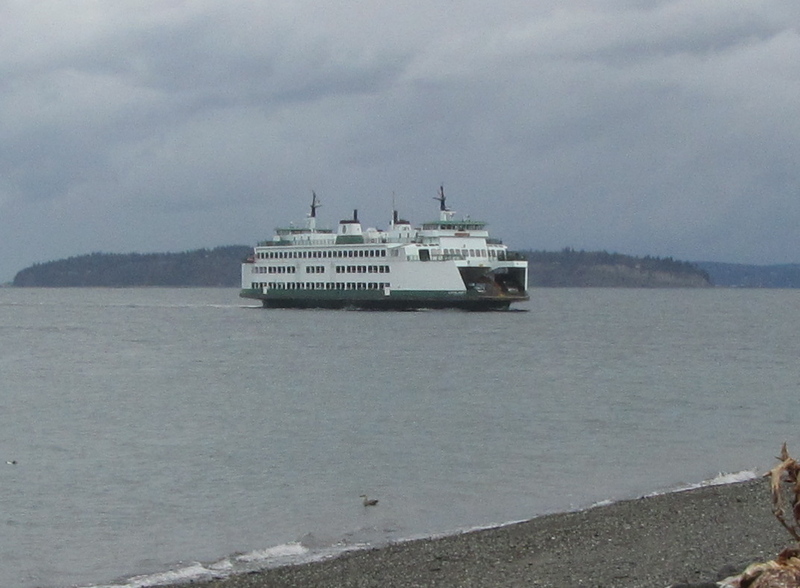 In the Seattle area, the ferries are just an extension of the highway system, criss-crossing the Sound to islands and the Olympic Peninsula. This past summer, my kids and I took a ferry over to the Peninsula to the Scandinavian town of Poulsbo. 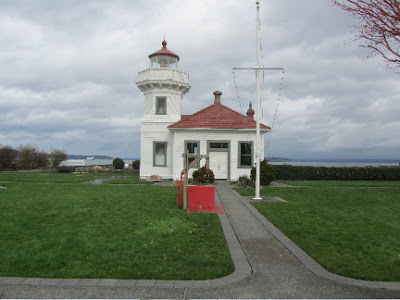 In November, the whole family took a different ferry to San Juan Island, to roam the waterfront town of Friday Harbor. Yesterday, I just sat and watched the ferries come and go from Whidbey Island, the island just across the Sound from us. I always enjoy my encounters with the wildlife here. The gulls hung around for handouts from my snack. A blue heron languished by the edge of the water. And I had a friendly chat with a harbor seal. 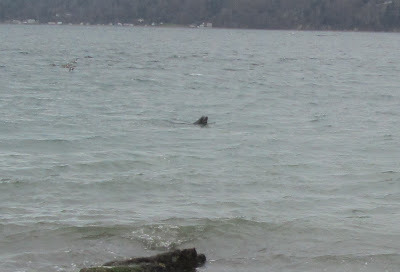 He was quite close to the shoreline, and apparently very interested in my presence. I was the only human on the beach, and he seemed to want someone to play with. He barked at me for several minutes before diving back down. Only to pop back up a few feet away. There's a very long stretch of this beach, perfect for "thotful" walking. 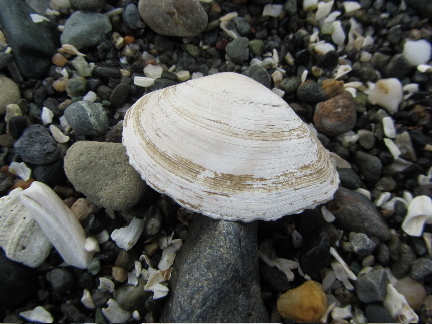 I looked for sea glass, beautiful rocks, and the perfect shell as I tread over the coarse sand. I searched for crabs, one occasionally washing out of his hiding place with the incoming waves. There are several man-made features here. And a wedding circle, very busy on summer afternoons. Yesterday, it was just me, on a bench, enjoying the view. Spending time at the beach doesn't solve any of my problems or worries. But I always come away relaxed and ready to handle whatever crisis may come next. I'm calmer just going along on your beach trip. Thanks for sharing the beautiful pictures. It is a very calming place. It's quiet, but in a different way. 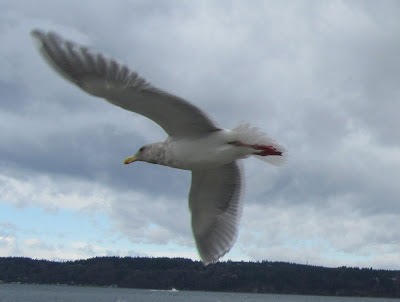 I listen to the cries of the seagulls, the small waves hitting the shoreline, an occasional train or a ferry foghorn. Thanks for coming along on my visit. It looks cold but lovely :) I like travelling on ferries as well - we have them on the river as part of our public transport system, just like buses, and it's a lovely way to travel. It was a bit chilly. The wind doesn't help in that regard, either! But we're used to it. We bundle up for a day at the beach, this time of year. You're in Brisbane, right? I'll have to look up your area. I didn't realize you had a river running through the city large enough to warrant a ferry system. How little I know about other parts of the world!! your husband's guesses are very intriguing. I can definitely understand the similarities to England, and parts of France. My experience with New Zealand is limited to pictures, so I can only guess that their landscape and scenery is similar to ours in the NW. I have always wanted to visit Oregon so I very much enjoyed your pictures, what a lovely place to be able to have all to yourself. There's a section of the Oregon coast that is stunning. There's a rock formation just off the shoreline, I believe called Haystack Rock. It has a rugged and untamed feel to it. I hope that you someday get the chance go to Oregon. There's something about water that invites contemplation. I love going to Lake Michigan but rarely do it at this time of year--COLD with the wind blowing off of it. Just being outside, especially walking or riding my bike, helps me put my thought in order. Seems I'm not alone in this! 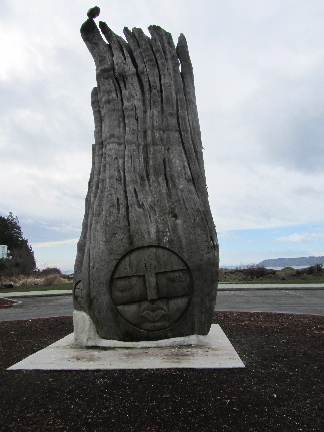 Your waterfront areas are beautiful. I'm glad that you enjoyed the pictures! I think that there is great beauty just about everywhere. I love the mountains, open plains and desert landscapes, as well. I hope you're doing better this week. That nasty spider bite must have been awful. Wow... Those pictures are wonderful! I have never lived near the ocean. Somehow the whole idea of being able to look out to sea fills me with awe... but it also scares the pants off of me! I grew up near the water, so this has always felt comforting to me. I understand how you must feel, though, as I'm not sure I could comfortably live where there are tornados or hurricanes. I would freak out with the first warning! Thank you. Somehow, a gray day at the beach feels completely different to me than a gray day in the house. At the beach, it is soothing and peaceful. At home, a gray day always makes me feel confined. All the more reason for me to go to the beach more often in winter, I believe! Lovely photos! I feel calmer just going through your post! Thank you! It is amazing that a bit of time spent outdoors (whether at the beach, at a park, in the mountains, or where ever) can refresh and revive us so well. I do the same thing - the beach always calms me, no matter the weather! I consider us fortunate to live near the water! 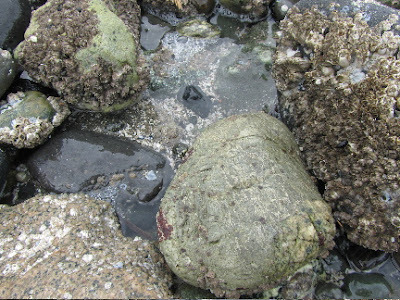 Your beaches probably look much like the ones near my home. We live in such a great part of the country. We can visit mountains, beaches, deserts,forests, all just a few hours away. I LOVE the Pacific Northwest. I've never lived anywhere else and I don't have any desire to. I've now lived here over half of my life. When I go back to California to visit, I always notice how brown the air and ground is. Then I return here and see all the trees, clean air, clean water and am glad to call this home. I still like to go to Calif for the sun every once in a while, though! :-) You're right, we have so much variety in scenery here!